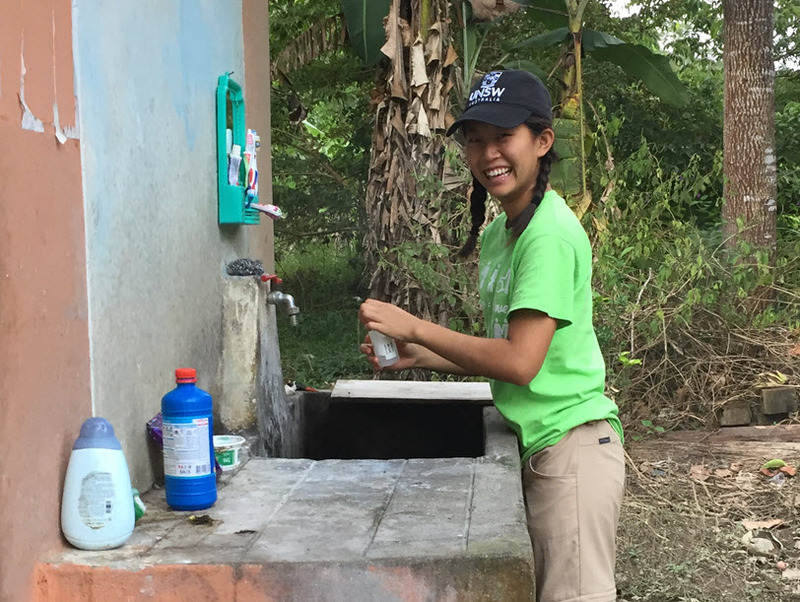 Emma collects a drinking water sample from a household in Shintuya, Madre De Dios, for heavy metal testing. 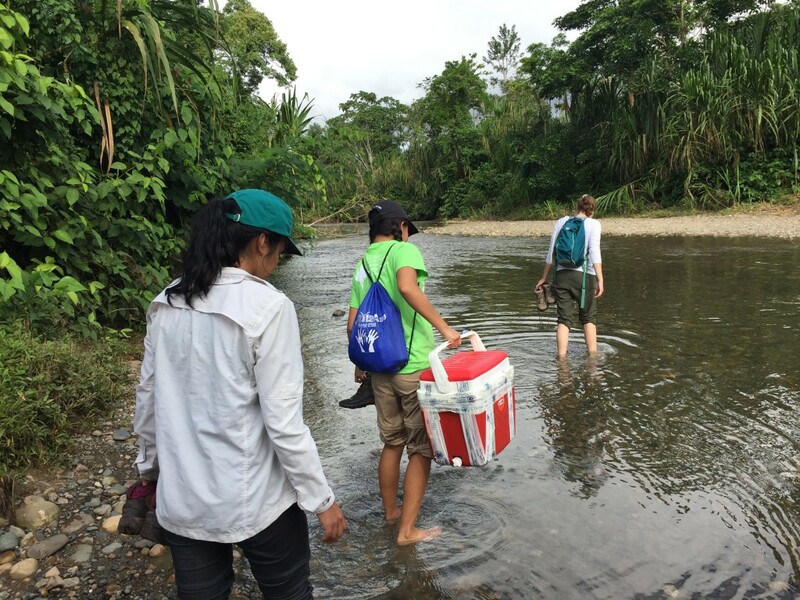 This summer, I had the privilege of traveling to Peru with a Bass Connections team looking at the impacts of Artisanal and Small-Scale Gold Mining (ASGM) on environmental and human health in the Madre De Dios region. Specifically, the project was looking to connect the use of mercury as an amalgamate and other mine tailings to heavy metal exposure through drinking water and dietary consumption of fish. After traveling for seven weeks, I can safely say that this summer was the experience of a lifetime—full of surprises, learning and reflection. As this was my first field research experience, I learned a ton, but the most important lesson was that you have to be flexible and adjust to changes. In my everyday life, I like to be organized, I like having lists and I like making plans. At Duke, these habits keep me sane and allow me to accomplish what needs to be done. In contrast, I believe that these tendencies made my transition into this summers’ field research much more difficult. As I soon came to realize, changes to plans frequently happen in the field. At the beginning of the summer, I would have liked to have thought that I was prepared for this aspect of the trip. For the past two summers I have had the opportunity to travel with Duke Engineers for International Development (DEID) to Madagascar. Frequently, we dealt with late contractors and community members in addition to delayed materials shipments. Though these experiences helped me learn patience, there always seemed to be a clearly prescribed action for each situation—wait for the contractors, community leaders or materials to arrive. That wasn’t always the case this summer. When wrenches were thrown into our plans, our team had to come together to make a decision as to how to proceed. Through multiple cycles of this pattern, I came to the realization that it is unwise to hang on to the reason that your plans were derailed. In fact, our Peruvian translator and friend, Sol, taught us the Spanish phrase, “Ya fue,” meaning “It already happened.” This saying, to me, came to mean that you can’t change what has already happened, instead you have to focus on your reaction to the circumstances thrown at you. Early on in the project, we discovered that there were much lower anemia rates than we had previously expected. We suspect that this drop was largely due to Qali Warma, a national nutrition plan put in place by the Peruvian government which provides lunch to all school children. In native communities, the program also provides breakfast. Though the program was started more than five years ago, recent changes in the programs’ structure, largely aimed at reducing anemia rates, have made it possible to improve the diets of the school children. 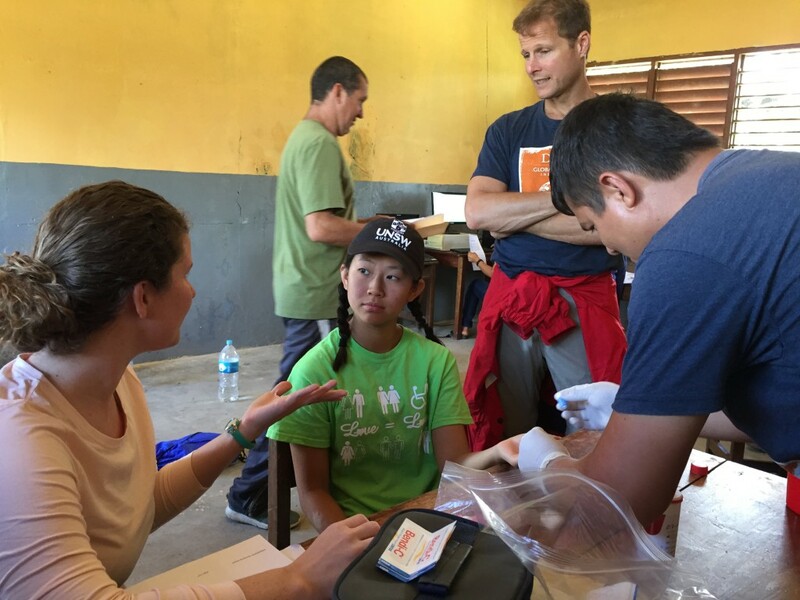 While this decrease in anemia rates is amazing news for the people of Madre De Dios, it meant we were going to have a difficult time enrolling the number of families we originally set out to study. and DGHI affiliate, and Renso Malaga Aguero, a Peruvian field worker. We had frequent conversations about statistical power and how to increase our participation rate. These discussions led to changing our itinerary of the communities we had planned to visit and working more closely with the various local health posts. In the end, we collected the samples and conducted the surveys we could. Though it was easy to get frustrated when things weren’t working as we thought they should, I highly doubt we would have been as successful as we were if we weren’t able to adjust our plans. professor of environmental engineering, cross a stream to visit a fish farm.